This is a pretty awesome style in my opinion and I've really enjoyed playing it. I think it's important that you understand a little history of the genre; it's a fusion of jazz elements with various rhythms, particularly the samba. It was greatly inspired by cool Jazz, but the music derives from samba although it's more complex harmonically and less percussive. 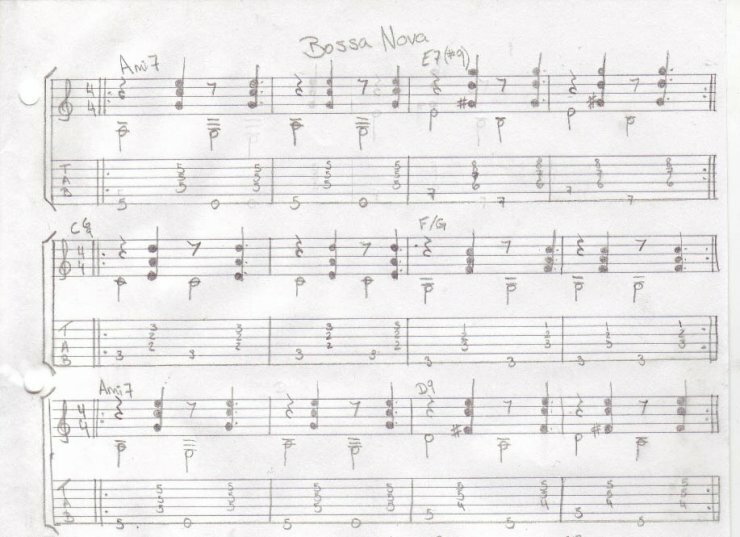 This will be the beginning to Bossa Nova, and I'll introduce you to some awesome chords and some of my favourites. It needs no pick, this implies using all of your fingers and your thumb. To those who aren't used to doing this, this will help you to alternate between the thumb and the rest of your fingers. You should first learn to be comfortable with this rhythm, so practice this pattern until you can play any chord pattern with it. You can use any voicing you want; the important thing is to keep a rhythm feel. The thumb plays the bass notes on 1 and 3, while the fingers pluck the chords in unison on 1 and 2, delayed on 3. Overall, the rhythm has a swaying rather than swinging (as in jazz) feel. As bossa nova composer Carlos Lyra describes it in his song; "Influência do Jazz", the samba rhythm moves "side to side" while jazz moves "front to back". In terms of lyrical themes and length of songs (typically two to four minutes), bossa nova is very much a "popular music" style. However, the typical structure differs slightly from European and North American rock and pop based music's standard format of two verses followed by a bridge, and a closing verse; bossa nova songs usually have no more than two lyrical verses, and almost never a bridge. This first image is basically to introduce you to chords, and starting off by playing one chords for two bars to get you comfortable with the positions and rhythm. So keep working on that for a while until you've got the rhythm down and increase the speed so you're comfortable moving from chord to chord. Again, increase the tempo once you've got it down pat. I used to jam bossa nova on drums, so this got my attention. Great lesson! Im gonna fiddle with this for a while. Ah cool, the druming rhythm is awesome. Don't forget I've got the mp3 there just incase you don't know the way it's played. Cool I'll definitely try it. FenderCat, I think you'll have to download a certain program to get the music player on this site to work. AdobeFlash player probably, I got it right away so I'm not sure of the program unfortunately. But the melody itself is still there and plays fine. Together with your other lesson about hybrid-picking this is real fun!